I LOVE teaching math. I did NOT feel this way before Common Core. I thought teaching Math was boring. I opened a text book and taught from it. Sure, I played the games (I still love Top-It). But it didn't excite me. I didn't feel creative. Then, three years ago, my district introduced Common Core in Kindergarten. I was introduced to a new way of teaching math. I enjoy teaching math now, and, more importantly, my KIDS ENJOY learning math. Here is a few pics of my current math centers. First, this is a simple center that was a HIT! One of my co-workers had these bare trees laminated on blue paper. My amazing EA just bought my these plastic leaves (Target dollar spot, of course!) 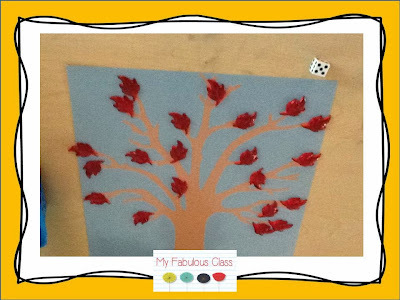 The kids simply rolled a dice and added the leaves. So simple yet they could have stayed at this center all day. 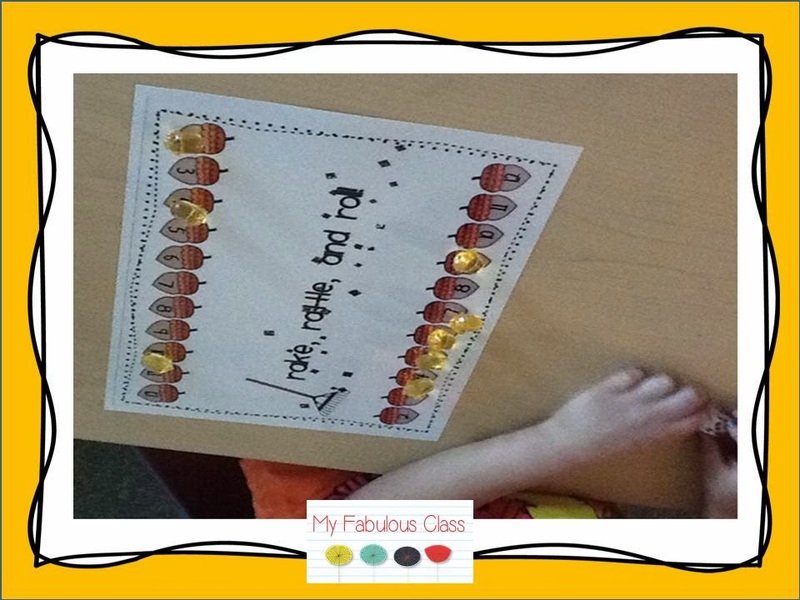 This activity was inspired by the ten frame candy corns everyone has. 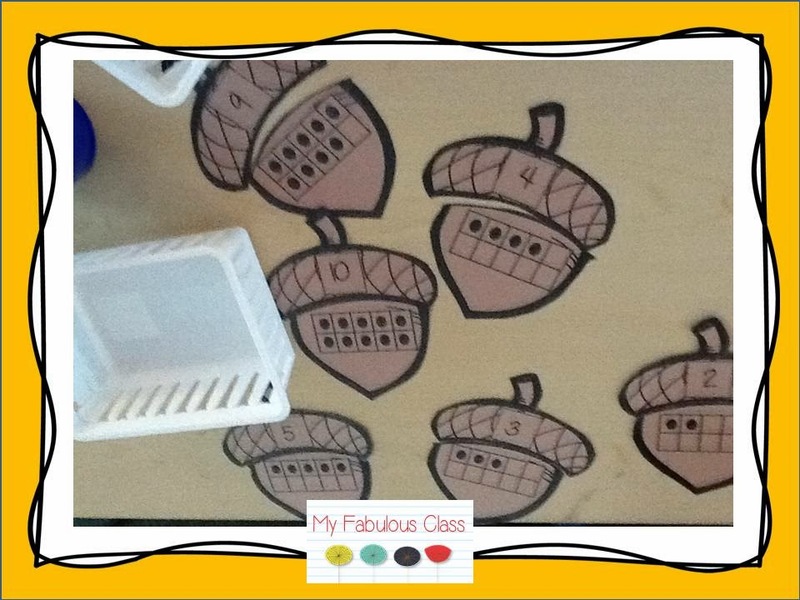 The kids match the top part with a number to the bottom with a ten frame. 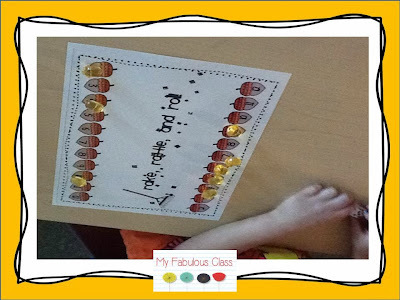 This activity is an ink saver that was run off on brown construction paper. It may be available for free this week...but only on my blog. This is my FAVORITE center from my new Fall Math Pack. 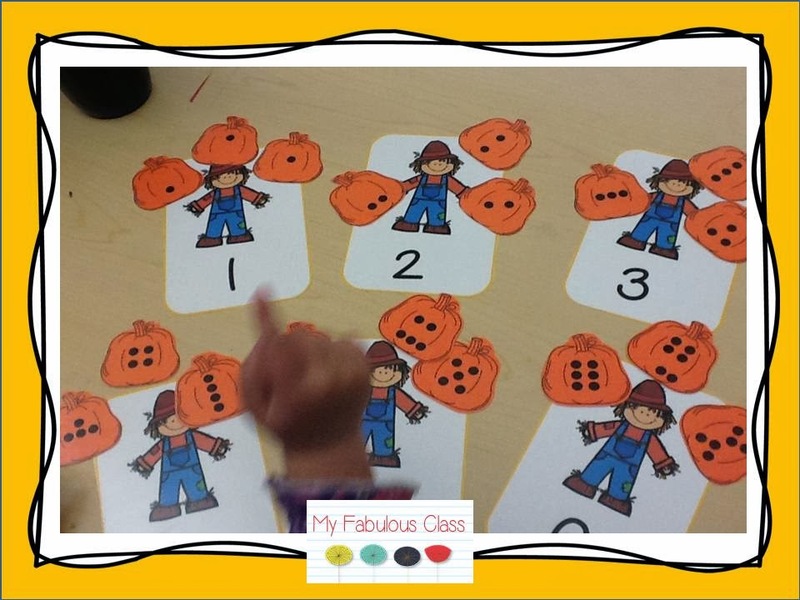 Subitizing pumpkins. How fun is that? For my kids who need extra support, I only give them cards 1-5. Since we did subitizing candy canes last month, my kids are doing better with it. 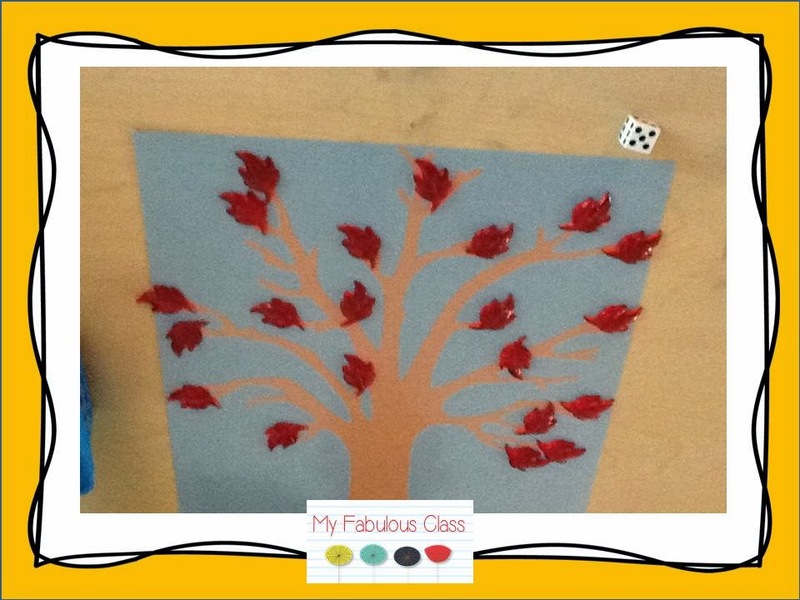 I need to take more pictures from my Fall Math pack. There were A LOT of math goodies. 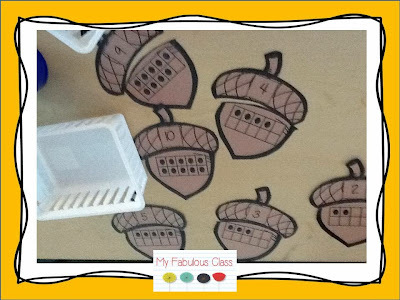 My EA also got me these acorns from Target that go perfect with Miss. 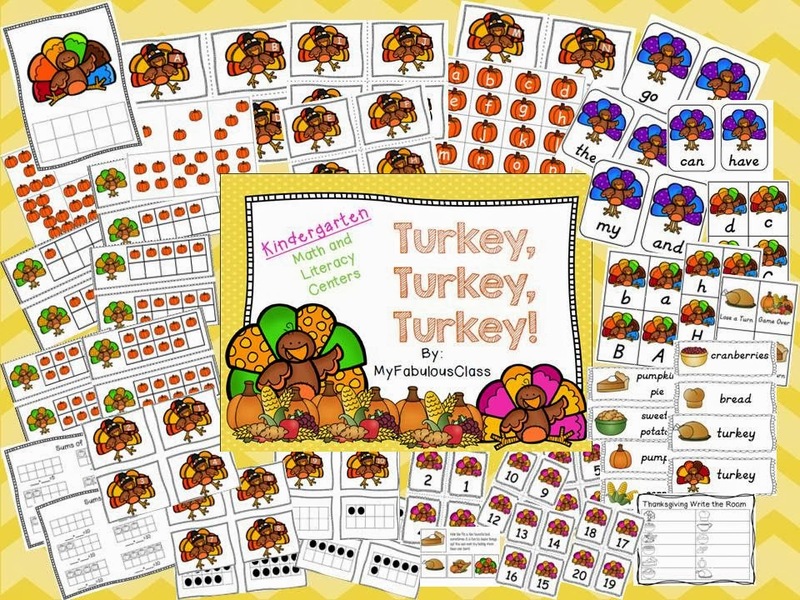 Kindergarten's November Centers. 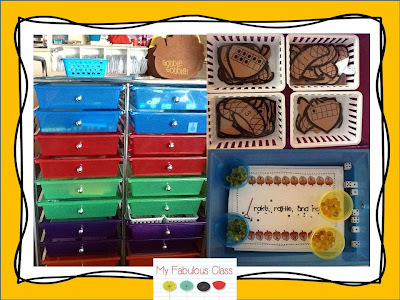 This is a picture of how I organize my math centers. I place everything I need in one of these drawers. Okay, some items go on top. Do you see the cute turkey bag? Can you guess where that is from? (I LOVE TARGET). I have it stocked for 2 weeks at a time. The top drawers have current centers and the bottom was are for future centers. This is great if you have to be out of the classroom. Your sub can teach the centers your kids have already learned. I let my kids guide how long they use the centers. Some centers are put away after two days. The more popular ones stay out all week and often make guest appearances again and again. I love when my students are able to stay highly engaged in an activity so I can work with a small group. 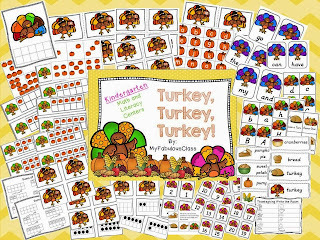 Later this week I will be introducing my Turkey, Turkey, Turkey Centers. 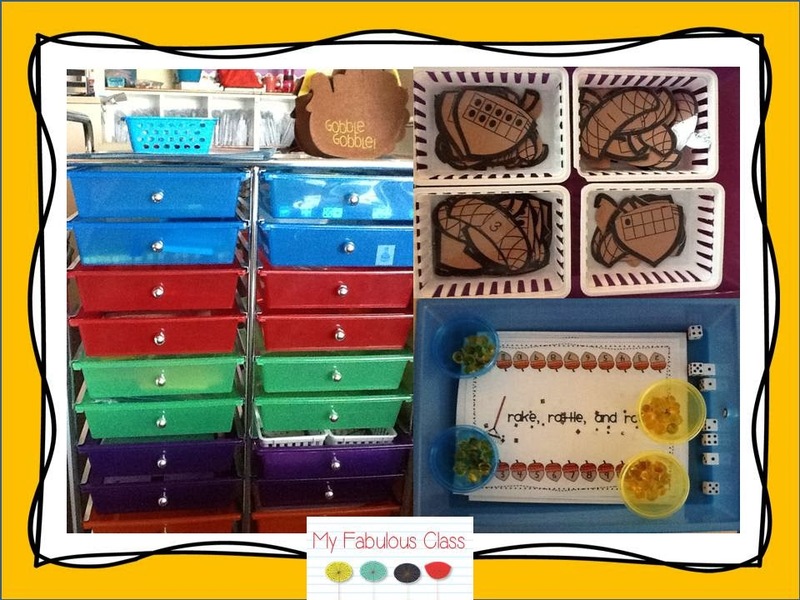 I can't wait to use these centers!!! Have you entered my giveaway? Tuesday is the last day. Then I will post a NEW giveaway on Wednesday.